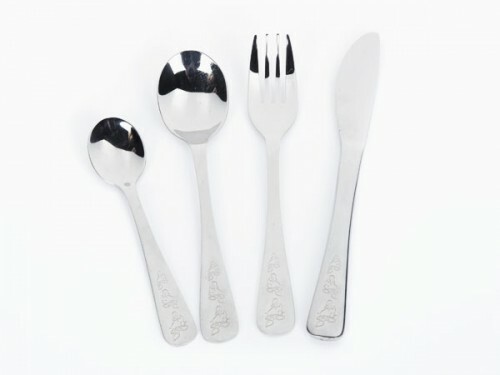 Child's cutlery set, engraved with little duckies. Made from 18/8 stainless steel. The set includes a fork, a knife and two spoons. 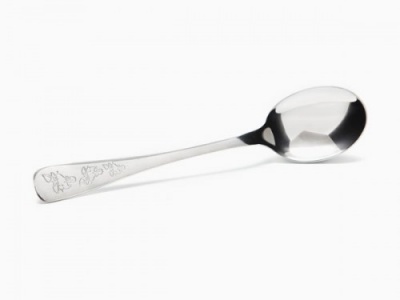 A wonderful child's cutlery set, engraved with little duckies. Made from 18/8 stainless steel, the set will last forever. The four-piece cutlery set includes a fork, a knife and two spoons. This set would make a nice gift, presented in a cardboard sleeve. The smaller of the two spoons is perfect for babies just starting on solid food. The fork and spoons are rounded, which not only holds the food better, but fits better in a child's mouth. (think of a little shovel). The fork and the knife would suit an older child as they have slightly sharp edge. Each piece has a duck motif engraved on the handle.